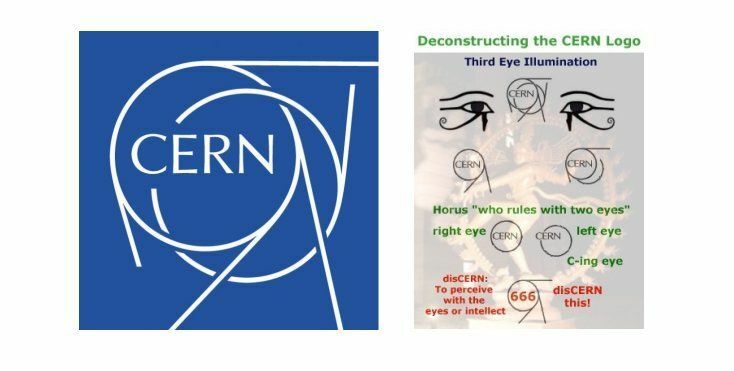 CERN=666 and Bob's work with the image breaks down the rest. CERN Atlas experiment logo. The body of Atlas forms a T and the outline of the globe forms the O for a blatant TO Mark of the Beast image. The two crossing spheres inside the main part of the globe form an X making an XO MOB image. Also, the two spheres can be viewed as two circles combining with the outline of the globe for a triple-O 666 signal. An argument can be made for the presence of more XO MOB images if we look at Atlas' legs bent and spread combined with his arms forming the X combined with the multiple O's of the globe, as well as the circular base on which he is kneeling. 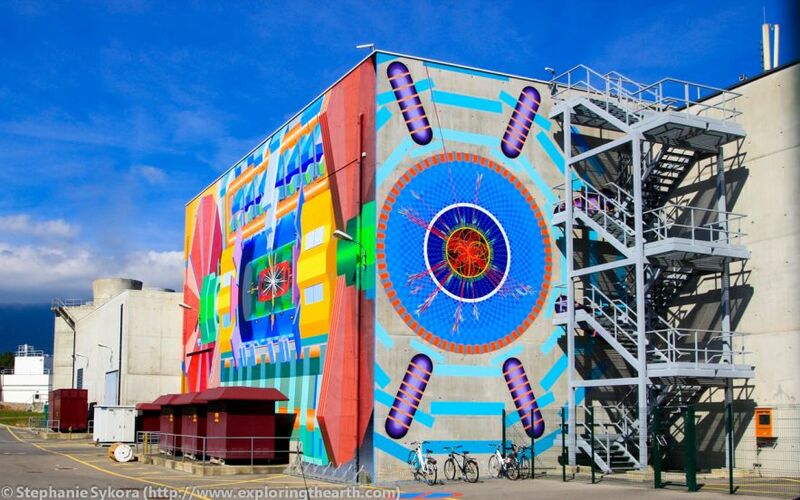 Mural on the side of the main building that houses the Atlas experiment. An obvious XO Mark of the Beast image. A triple-O 666 MOB signal is present as well with the layered circles. Interesting that there is a bike rack in front of the building as bicycles are symbols of dimensional transport vehicles! Atlas experiment particles forming an XO Mark of the Beast image. A plus sign type of MOB image can also be seen as well. It also appears that there is a triple-O 666 Mark of the Beast image formed by the layered circles in the middle of the collision, with three larger circles radiating outward from the center. Lastly, if you take the outer layer of the collision field as one circle, the inner layer with the majority of the particle field as the second circle, and the inner "bullseye" as the third circle there is yet another triple-O 666 present! 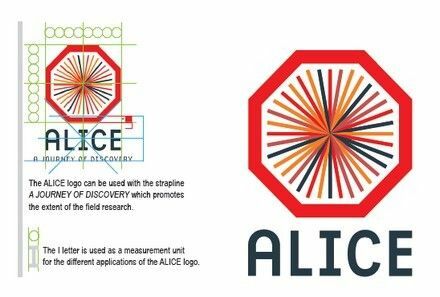 CERN Alice experiment logo. The multiple streams crossing through the circle in the middle form several XO Mark of the Beast images and a plus sign style MOB image is also present in this logo as well. Lastly, an Eye of Horus is made as they use the octagon particle collision field portion of the logo to dot the I in Alice. 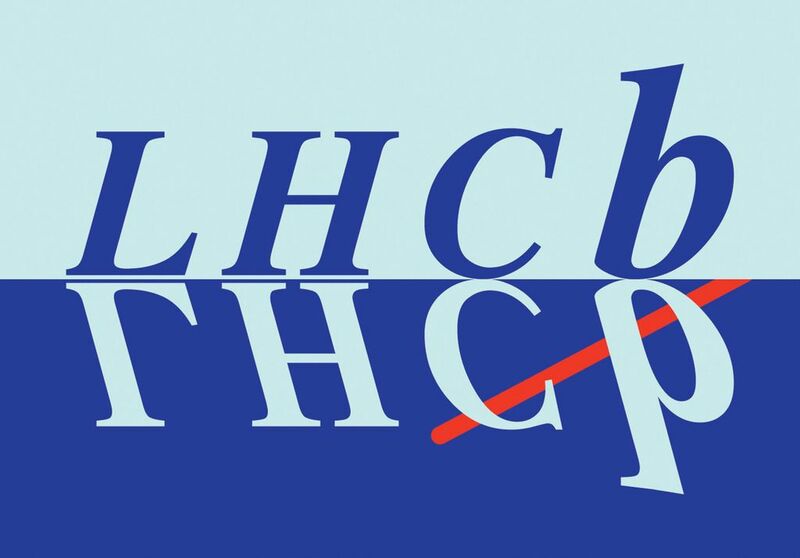 CERN LHCF experiment logo. The L next to the edge of the oval can be viewed as an upside down Tau Cross making an TO MOB signal. The particles behind the "CF" are forming several X's creating multiple XO Mark of the Beast images. The calling out of the "CF" using colors is making a 666 signal as the letter C is the 3rd letter of the alphabet and F is the 6th letter, which implies a 3x6 or 666 signal. Some more subtle MOB images are also present in the logo. The H can be viewed as two Tau crosses coming together and located next to the implied O of the letter C can be viewed as three TO Mark of the Beast signals. The lower case F can also be viewed as a particular class of MOB image that is seen with lower case T's. The lower case F is an MOB signal by itself, but also forms yet another TO type of Mark of the Beast signal when seen in conjunction with the implied O of the letter C.
Magazine covers featuring the Vitruvian Man and CERN. Each cover contains two men inside a circle. The number of man is 6 and the letter O is the 15th letter of the alphabet. When taken as O=15=1+5=6 each cover is a 666 signal! There are six magazines in total, each cover with a large O on the outside for a code 66. If you refuse to believe that the Vitruvian man is really two men, then you still have another 666 signal with the six magazine covers, the six circles, and six men! Each cover signals an XO Mark of the Beast formed by the man with his arms raised and legs spread. A TO Mark of the Beast image is formed by the man with his arms stretched out parallel to the ground. In addition to all of that, you see the various particles crossing through the main circles forming several MOB images as well as the large line crossing through the circle from upper left down to bottom right. CERN Totem experiment logo. The word "totem" has two TO Mark of the Beast images formed by the "TOT." 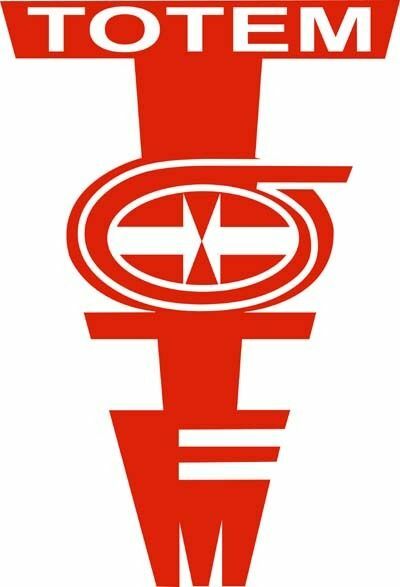 The logo capitalizes on this and places the word totem in the upper portion of the first large, red T going horizontally. The vertical spelling of Totem duplicates these TO MOB signals and then takes it even further with the enhancement of the letter O. 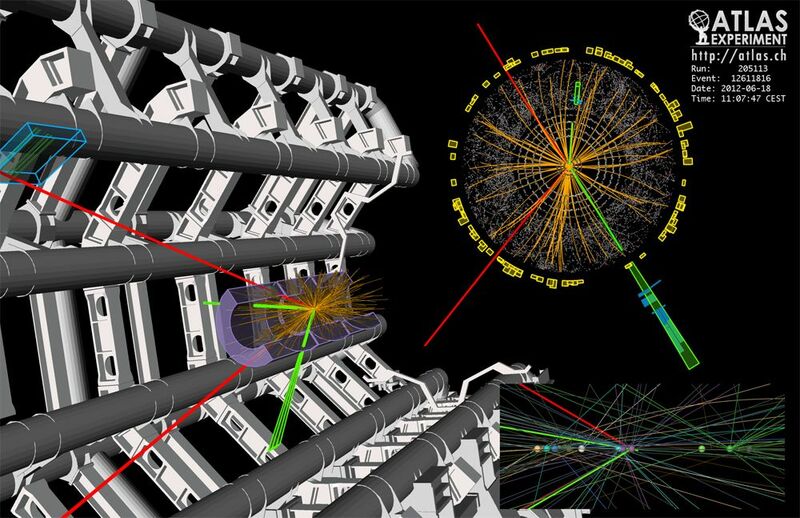 There is a 666 CERN style MOB image present, as well as an XO formed by the upper portion of each of the white arrows coming together to form an X inside the O! The two arrows may also be viewed as T's forming yet two more TO Mark of the Beast images! CERN LHCB experiment logo. The imagery here is a bit more subtle. The red line is crossing through the circle of the C and the P for two crossed circle Mark of the Beast images. One could make an argument for a 666 signal being present with the two lower case B's each making a 6, and the red line combining with the bottom lower case C to form the third 6 of the 666 image. One of CERN's main buildings is chock full of Mark of the Beast imagery. 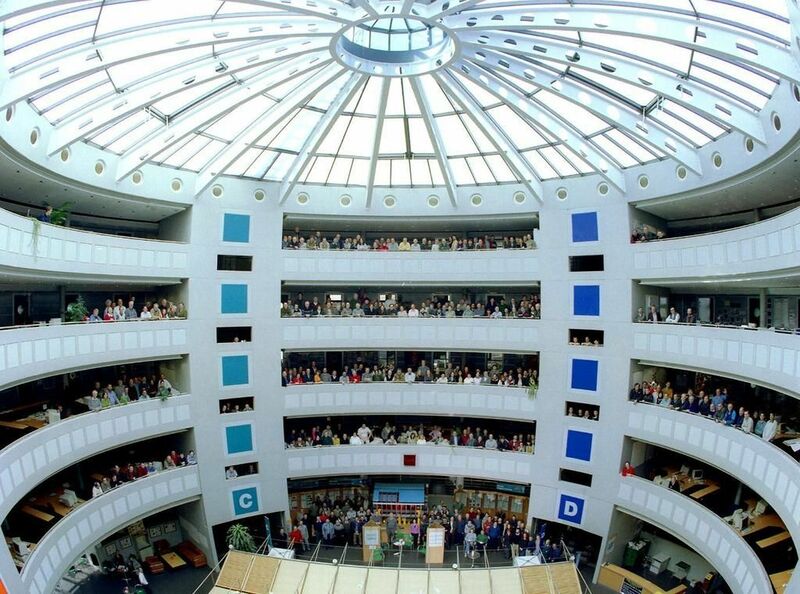 The building appears to be circular in shape and there are 5 floors and the circular domed ceiling makes the sixth circle for a triple-O 666! There are several arches crossing through the glass domed ceiling forming several XO Mark of the Beast signals as well. There also appear to be three layers of circles making up the domed ceiling for yet another triple-O 666! 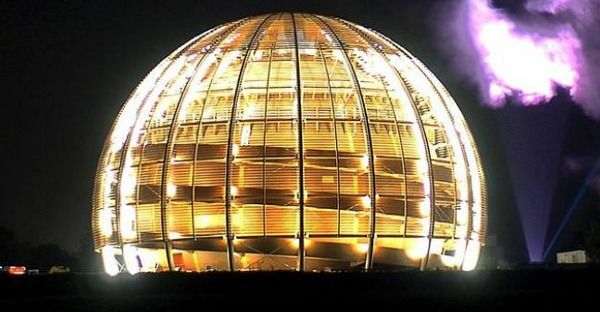 Cern Globe of Science and Innovation building. The design of this building is a global grid like design that has too many crossing circles to count! Jade Helm - Not related to CERN, but an important sign of the times. The two arrows form an XO Mark of the Beast, and the large knife forms an upside down T for a TO MOB image as well. The blade of the knife splits the E of Jade and the H of Helm to call out a reverse "HE" as in "Horus Eye." Horus is the original "HE-Man," which is part of their clever play as they are using a part of the old HE-Man cartoon "Masters of the Universe" tag line in their logo. Their arrogant claim to be Masters of the human domain will only be to the extent which my Sovereign God allows, and for only a very brief season!